PRESTO is a powerful, very fast and cost effective In- Circuit Serial programmer for a wide range of popular Components – microcontrollers, serial EEPROM and Flash memory chips, CPLDs and others. PRESTO operates on a USB port and requires no external power supply. PRESTO is optimized for high speed, for example it programs and verifies a full PIC18F8720 in 6 seconds! (3 seconds for programming and 3 seconds for verification). Complete eCOG1 in less than 3 seconds. Hundreds of devices are supported by the UP software and the list is growing continuously. 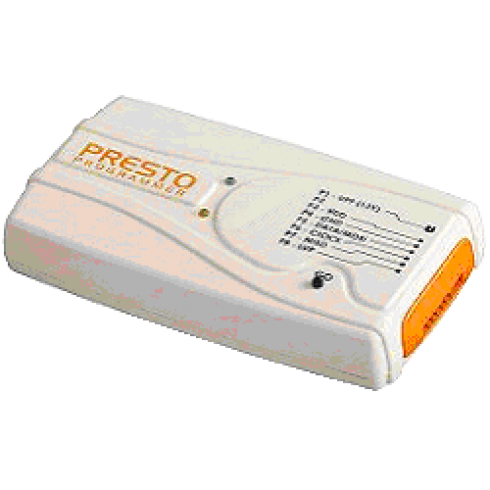 Moreover, many other parts can be programmed using JTAG or other software for PRESTO. For detailed information, visit the pageSupported Devices. In-Circuit Serial Programming (ICSP) or In-System Programming (ISP) is a very beneficial and frequently used MCU feature. PRESTO directly supports this function using a dedicated connector and an included cable. The target application device can be either powered by PRESTO (5 V nominally) or powered by an application within a voltage range of 3 to 5 V (with a ±10% tolerance, i.e. 2.7 to 5.5 V). The voltage range can be extended by two special headers – HPR3V3 (for 3.3 V output) and HPR1V2 (for 1.2 to 3.3 V support). Overcurrent limitation on target supply and programming voltages remarkably reduces the risk of damaging parts because of operator error. Target supply overvoltage detection is also implemented. The program UP supports PRESTO as well as other ASIX’ programmers. It offers many advanced functions like projects, command line control, Windows message control, workspace setup including user keyboard shortcut definitions, serial number generation by various methods, etc. UP works in Windows XP/Vista/7/8 (please contact our support team if you need to work with older OS version, e.g. Windows 2000) as well as in Linux (using Wine). Devices with JTAG interface and eCOG microcontrollers are supported by dedicated programs JTAG SVF Player andeCOG Programmer, respectively. Microcontrollers with 32-bit ARM core are supported by OpenOCD and some of them also by easy-to-use Armine application. 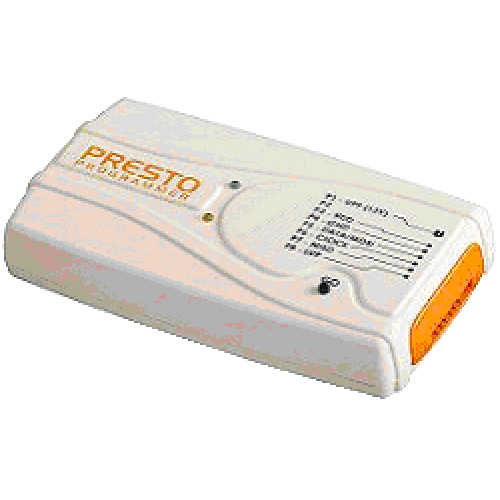 The advanced control of the PRESTO programmer can be made using aPRESTO .DLL Library. Software upgrades are freely available for all users on the Internet. They contain new device support, new functions and algorithm updates if required. Now with LINUX support (using WINE). GO button allows the user to comfortably start the device programming, without the need for a PC keyboard or a mouse.LEDs indicate programmer status – green LED ONLINE signals a working USB connection and yellow LEDACTIVE indicates that PRESTO is operating (programming, reading, …). PRESTO is powered by the USB bus, so there is no need for any additional supply adaptor. PRESTO is small, lightweight and compact.